December 11, 2013 December 11, 2013 k3fitLeave a Comment on Wacky Wednesday: Substituing! As we all embrace the Holiday season there are many ways we can make our treats a bit healthier! Check out the substituting chart to see what kind of ingredients you can swap out to make soups, cookies, and breads nutritious and delicious for everyone! Below is a Berry Christmas treat that has some simple swaps for a moist and oh so yummy coffee cake! 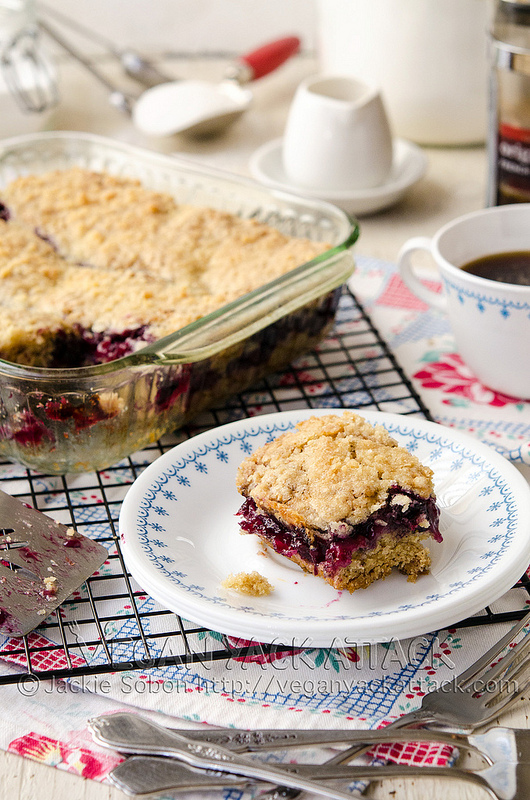 A fresh blend of berries and soft, sweet cake make this coffee cake a winner! ½ T. Apple Cider Vinegar + Non-Dairy Milk equaling a ½ C.
In a medium-sized saute pan, heat the blueberries, strawberries and sugar over medium heat, along with half of the water. Bring to a boil and reduce to low-medium heat, stirring occasionally. Whisk the cornstarch and remaining water together, in a small cup, to dissolve the corn starch. Once the fruit has broken down a bit, add the cornstarch liquid to the pan and stir. Add the lemon zest, continue to stir until the starch has become clear and the fruit mixture has thickened a little. You want it to be thinner than jelly, but not runny. Take it off the heat and set aside. Preheat oven to 350ºF and get an 8″x8″ baking dish out. You do not need to oil it. Pour 1½ tsp. Apple Cider Vinegar into a 1 C. measuring cup. Then, fill it up to ½ C. with Non-dairy milk, this is your buttermilk substitute. Make the flax egg by whisking together the hot water and ground flaxseed in a small bowl/cup and setting it aside to become gelatinous. Next, sift the flour, sugar, baking powder, baking soda, and salt together, in a large bowl. Cut the vegan butter into to the flour mixture, using two butter knifes or a pastry blender, until it becomes crumbly. Stir the flax egg, “butter milk”, and vanilla together, then add it to the flour mixture, stir together until there is no loose flour, but do not over mix the dough, it will still be slightly chunky. Divide the dough in half, spreading one half to cover the bottom of the baking dish. Carefully place the berry filling on top of the dough, using spoonfuls at a time; then spreading it out evenly. Use a spoon to place the other half of the dough on top of the berry filling, do not attempt to spread evenly or you will mix it in with the berries. Just place the spoonfuls of dough in one layer over the filling. 10. For the cake topping, whisk together the flour and sugar in a small bowl, then cut the vegan butter into it until it is crumbly. Sprinkle this over the top of the coffee cake. 11. Bake for 45-50 minutes, or until the top is a light-medium golden brown. Wait at least 30 minutes for it to cool, as it is best the closer it is to room temperature. Previous Teach Your Kids Tuesday: Festive Holiday Eating! Next Take Care of Yourself Thursday! Shake ya Grove Thang!